In this post, we wish to share a comprehensive online resource called Paths to Literacy that provides a wide range of information for and about children and youth who are blind, deafblind, or have multiple disabilities. Besides general information about Paths to Literacy, we also will share a specific post to their blog written by an APH employee. What Is Paths to Literacy? Paths to Literacy http://www.pathstoliteracy.org/ is an online Community of Practice, devoted to literacy for children and youth who are blind or visually impaired, including those with deafblindness or multiple disabilities. A collaboration between Texas School for the Blind and Visually Impaired and Perkins School for the Blind, the site offers lesson ideas, resources, tech updates, and more. The emphasis is on practical ideas that can be used in the classroom, home or community. Topics range widely, from braille drawing to UEB lesson ideas to the creation of story boxes and experience books. There is an active presence on social media as well, with lively discussions, questions, and frequent updates. Subscribe to the free weekly newsletter to receive posts, such as this one on beginning tactile graphics. The site welcomes contributions from its readers! Parents, veteran TVIs, graduate students, and O & M instructors all share ideas, questions, and resources. Contact pathsto.literacy@perkins.org for more information. We encourage you to peruse their site, sign up for their newsletter, read their blog, and interact with them on social media. We also wish, however, to highlight one specific blog post that was written by an APH employee. Reach Out and Touch the Picture: From Concrete to Abstract Thinking was written by Dawn Wilkinson, APH’s Early Childhood Project Leader who also is a certified teacher of the visually impaired. 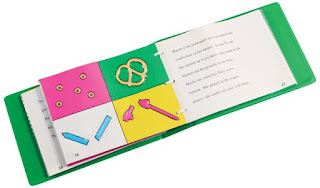 In this article, Wilkinson describes the process of teaching a child who is blind to learn increasingly more complex concepts through the reading of tactile graphics. As a student who is blind begins to understand simple concepts included in a tactile graphic, the student can proceed to learning more advanced concepts and, eventually, learn to read braille. Wilkinson’s article describes how children who are blind have learned from several APH products like one book in our On the Way to Literacy Series entitled Jennifer's Messes (shown in the included photo). 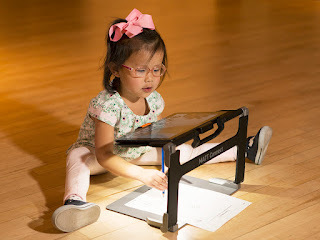 Learn about several APH early childhood products and develop a greater understanding of how children who are blind progress in their learning and recognition of objects by reading this informative post at http://www.pathstoliteracy.org/blog/reach-out-and-touch-picture-concrete-abstract-thinking.